Albert Einstein said, “Ethical axioms are found and tested not very differently from the axioms of science. Truth is what stands the test of experience [experiment].” Since this Republic was first gifted to the world, ours has been a quest to prove to mankind that the world’s great experiment in freedom, “a government of the people” can long endure. In any experiment, controlling for variables and clarity of result is vital. 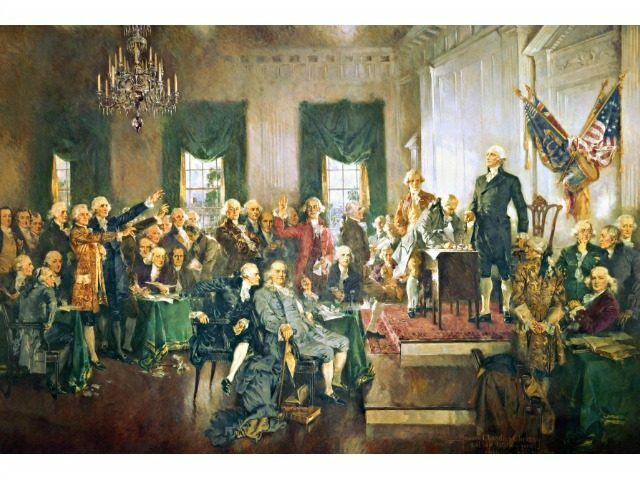 The construct of our founding fathers and our Constitution was a system of open government where issues and decisions were debated before the world and the votes, actions, or overreach of each government representative were meticulously recorded and presented to the American people who could then have the clarity to hold them accountable in the next election (i.e. Obamacare). Thus, our experiment in freedom could control for variables and identify a clear result that could be clearly considered by all Americans. If we truly believe in the consent of the governed, then the governed must have clarity as to who and what they are giving their consent. There is nothing more basic to government of the people or the survival of this Republic than this clarity. Unfortunately, a little over 20 years ago, clarity of government was dramatically eroded in an already esoteric U.S. Senate when the rare practice of invoking the 60-vote rule on the motion to proceed to consider (to allow a bill to brought to the Senate floor for debate and amendment), became the norm. Unlike the 60-vote rule for debate cloture to get to a final vote (which gives the minority the power to extend and even perpetuate debate), this more recent application of the 60-vote rule gave the minority the power of continuous filibuster to prevent any consequential bill from being brought to the floor at all. Interesting. Two applications of the 60-vote rule; one to extend debate indefinitely, and one to prevent it completely. To logically defend one of these applications, is to fundamentally eviscerate the other. Those who would ignore this glaring paradox and still herald the sacred principle of 60 votes in the Senate then have the attending sacred responsibility to do away with the “sacrilegious” reconciliation procedure, since, once in a budget year, it circumvents the revered 60-vote requirement. Thus, these two core principles are antithetically juxtaposed. Carefully analyzed, the practical effect of the 60-vote no-debate rule in the Senate (which could be made non-debatable without affecting the 60-vote cloture allowing a final vote on passage) is perpetual stalemate without clarity or accountability. Ironically, this is a disincentive to consensus and it all but ensures frequent swapping of majorities, not on the basis of the policies defeated or enacted, but out of sheer frustration on the part of an American people who are thus, more and more divorced from understanding and participating in the nation’s substantive policy considerations. To the rescue, in this complex debate, come the excerpted solutions of no less than an experienced Senate Majority and Senate Minority Leader: “The country can’t be run this way, where nothing gets done.” … “Unless after this election there is a dramatic change to go back to the way it used to be” (before the “no-debate stealth filibuster”) “the Senate will have to evolve as it has in the past” … “But it will evolve with a majority vote determining stuff. It is going to happen” (emphasis mine), meaning that the majority, not 60 votes, would rule. These are not the words of Leader Mitch McConnell, but those of Harry Reid when he assumed Hillary Clinton would be President and Senator Schumer would be Majority Leader. Senator Schumer refused to comment and will likely continue to refuse. However, after such unequivocal statements to the contrary, to predicate America’s future on the hope that Democrats will suddenly be seized with an epiphany of fair play toward Republicans and not follow through with Mr. Reid’s plan, when given the chance, is to risk the survival of this Republic on a hope that has never manifest in the past. As now practiced, the minority in the U.S. Senate, by doing absolutely nothing, with almost no accountability accruing to them (using the “no-debate stealth filibuster”), can easily and nearly always either stop every legislative effort, or far more insidiously, sabotage it by requiring a “dirt and ice cream” result. This is especially true for the appropriations process (with profound implications for the Article One Constitutional Power of the Purse). Clarity and principle never have a chance to be seen, and the people never know who to blame or support. This is the most pernicious and dangerous element of the no-debate stealth filibuster. Unfortunately, nearly every major piece of legislation supported by the Trump Administration is on course to face this same fate. Long-term, this means political nirvana for Democrats, anathema for Republicans, and continued chaos and lack of clarity for America. It will be interesting to see what Donald Trump’s tweets look like when he fully understands this reality as he most certainly will. Elite intellectuals and sentinels of Senate tradition will tell President Trump and all of us mere mortals that we just do not understand the sage intricacies and distinguished traditions of the complex and ever evolving Senate rules. They now have a clarion responsibility to also tell us their plan, under those rules in this political age of polarization, in these, rare but fleeting, days of unified Republican government, to enact the policies necessary to save America before Harry Reid’s dreams and Mitch McConnell’s nightmares come true. Few things could damn the institution or this Republic more. The jury is out as to whether Democrats will insist on an extended filibuster on the confirmation of Supreme Court Nominee, Neil Gorsuch. To do so would clearly expose their abuse of the 60-vote “no-deliberation” rule with such clarity to the nation that it will be more difficult for them to use it (as they most certainly intend) to block or sabotage every major piece of legislation during the next four years no matter how important it is to the country. Rather than to deal with 60-vote no debate rule forthrightly in the Senate, House Republicans are now forced to try to repeal and replace Obama care through reconciliation. We will do our best. However, reconciliation means the legislation will have to fit through the “Byrd Rule.” Unless it is reinterpreted by someone (like Mike Pence) presiding over the Senate, the present construal of the Byrd Rule will not allow for full repeal or full replacement. This means that the legislation that emerges will not be a true consensus plan among or between Democrats and Republicans. Senate rules will once again have obscured and subordinated best policy considerations. Republicans’ quest to produce a policy facilitating an innovative, market-based American system that empowers patients, respects healthcare providers, and provides the greatest number of people the best healthcare in the world, in the most cost effective way, will fall short of its goal. Americans will not have clarity. Political culprits will escape accountability and the result will be legislation that neither fully repeals nor replaces Obamacare. Republicans will now own it just as it is imploding, and conscientious souls will risk brain damage trying to understand what and how it all happened. The Founding Fathers could have made provision for the King of England to filibuster the Declaration of Independence (just in case the revolutionary war went the other way). It certainly would have been far safer for them. However, if they had, the world might never have known what freedom looked like. Republicans must not now accept an equation of never being able to do good, noble and necessary things for this country today in the hope that it might prevent Democrats from doing bad things to it in the future. To risk nothing will be to risk everything. It is possible that changing the 60-vote rule or its practice in the Senate may one day prove disastrous, but we fail the test of our time if we allow that fear to blind us to the disasters that are certainly upon us in this moment. We are $20 trillion in debt. We are close to socialized medicine. The federal bureaucracy is growing out of control. The very foundations of the nation continue to be stained by the blood of over a million of its own preborn children every year. The Constitution hangs by a thread. The leading sponsor of terrorism in the world is on track to legally gain nuclear weapons. Our military and the nation’s place in the world in general have been devastated by the Obama years. The 60-vote rule did not empower Republicans to stop these things in the past when we were in the minority or the majority, but it does empower Democrats to prevent us from effectively addressing these dangerous realities in the present, anytime soon, or maybe…ever. So, to those apprehensive Republicans who have come to the moment of quiet capitulation to a Senate rule that now prevents critical legislation from even being brought to the floor for debate and amendment before the American people under regular order, let me take a load off your mind and encourage you just to relax. If Americans watch Donald Trump and a unified Republican government willingly allow ourselves to gridlocked again, given all the implications, and after all of our promises, Democrats will very likely regain control of American government sooner than we would ever hope, and when they do, as Mr. Reid has so eloquently explained, this little filibuster problem will be resolved. Unfortunately, we then may have thrown away the greatest opportunity in modern history to do those things necessary to save this country for this and coming generations. Congressman Trent Franks represents the 8th District of Arizona and is Past Chairman of the House Subcommittee on the Constitution.